CEDAR RAPIDS, Iowa – Assistant to the Secretary for Rural Development Anne Hazlett today announced that USDA is investing $309 million in 16 projects to improve rural electric infrastructure in 12 states . . . Today’s investments will build or improve 1,660 miles of electric line serving rural homes, farms and businesses. USDA is funding infrastructure improvements for utilities in Alabama, Arizona, California, Colorado, Iowa, Kansas, Missouri, North Carolina, New Mexico, Ohio, South Dakota and Washington. This entry was posted in NewsBlog and tagged Assistant to the Secretary for Rural Development Anne Hazlett, Nebraskans for Solar NewsBlog, rural electric infrastructure, rural electric utilities, USDA Rural Development on June 7, 2018 by Helen Deffenbacher. Community leaders in Central City expressed interest in making their community a trailblazer in clean energy by organizing a community solar garden. The project was kick-started by Mesner Development Company and their donation of a neutral site on which other Central City businesses could construct solar panels to offset their energy usage. Continue reading. 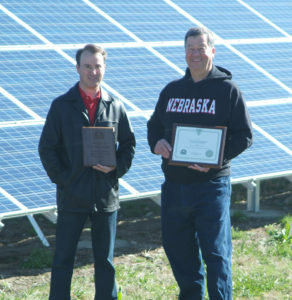 This entry was posted in Community Partners, Nebraska / Midwest News and tagged Central City's solar energy development, rural electric infrastructure, Rural Energy for America Program (REAP) grants, Rural Energy Savings Program, US Department of Agriculture (USDA), USDA Energy Development Office on May 17, 2017 by Helen Deffenbacher.